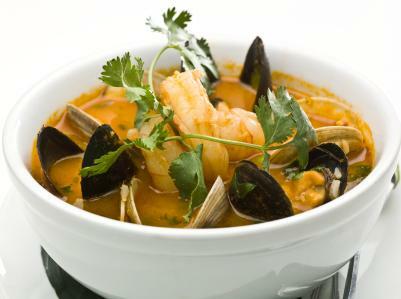 Preparing gourmet seafood chowder is easy-the biggest challenge being that you must find the best ingredients possible. There are many recipes for this lovely soup which range from extremely rich to those created for a health conscious diet. Add onion, celery, and carrot and sauté ten minutes or until tender. Add the potatoes, chicken broth, and seasonings and bring to a boil. Reduce heat and cover. Simmer, until potatoes are cooked through and are tender if poked with a fork. Combine flour and water and blend until smooth. Whisk flour mixture into chowder until thickened. Add milk and the can of clams, stir until combined. Add remaining seafood and simmer about ten minutes. Bring 1 cup of water with a couple tablespoons of white wine to a boil in a pan with lid. Add mussels, cover, and gently steam until mussels open. Remove mussels and discard any that didn't open. Let cool and remove mussels from shells, coarsely chop and set aside in fridge. In large pan brown bacon over medium-high heat. Add butter, onion and celery to cooked bacon and bacon fat. Add chicken broth and potatoes to pot and cook until potatoes are fork tender. Combine clam juice with flour and stir until there are no lumps. Add flour mixture to pot and whisk until chowder is thickened. Cook approximately ten minutes, until seafood is just cooked. Add heavy cream, wine and reserved mussels; season to taste with salt and pepper. In large pan, cook bacon until crispy; do not drain fat. Add onion, garlic, celery, carrots and cook until translucent and soft. Stir in bay leaf and thyme. Add tomatoes, clam liquid, water and potatoes and bring to a simmer. Simmer for until vegetables are tender. Add seafood and reserved clams and simmer an additional five minutes. 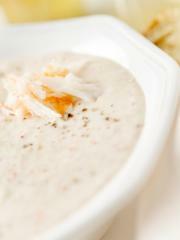 All gourmet seafood chowder recipes require superior seafood products that are fresh and come from a reputable source. The end product is only as good as the ingredients used, so purchase the very best.